Living with cancer is unpredictable. Living with cancer means that a lot happens to you, around you, and inside your body, it’s not often good, and yes, you lose a lot. You lose some abilities, you lose some time, you lose some brainpower. I’m not going to intentionally fill in any gaps here since January 2017. I’m just starting again, as much as I’m able. We’ll see how it goes. I don’t really think anything is ever black and white, completely good or completely bad. My latest CT scan, for example, was a mixed bag of news, even significant and insignificant. In a way, this helps me prepare for scans in general, if I believe that there won’t really be any extremes, or anything too shocking or groundbreaking. And then if there is, I get to be pleasantly surprised (or maybe unpleasantly blindsided, and I’ll cross that bridge if I come to it). The bad news on my latest scan is that the FOLFIRINOX didn’t really work, all of my “drop metastases” grew, my pancreatic pseudocysts grew, and I have a small pulmonary embolism (a blood clot in my lower left lung). Also, according to my latest lab tests, my tumor marker number has risen again, to the 150’s. The good news is that my original tumors (pancreas and liver) are relatively stable, and my doctor thinks it’s time to try experimental treatment, which means immunotherapy. Sometime last year, another CT scan revealed a few different bits and pieces of “worsening metastatic disease,” as my cancer grew and spread. 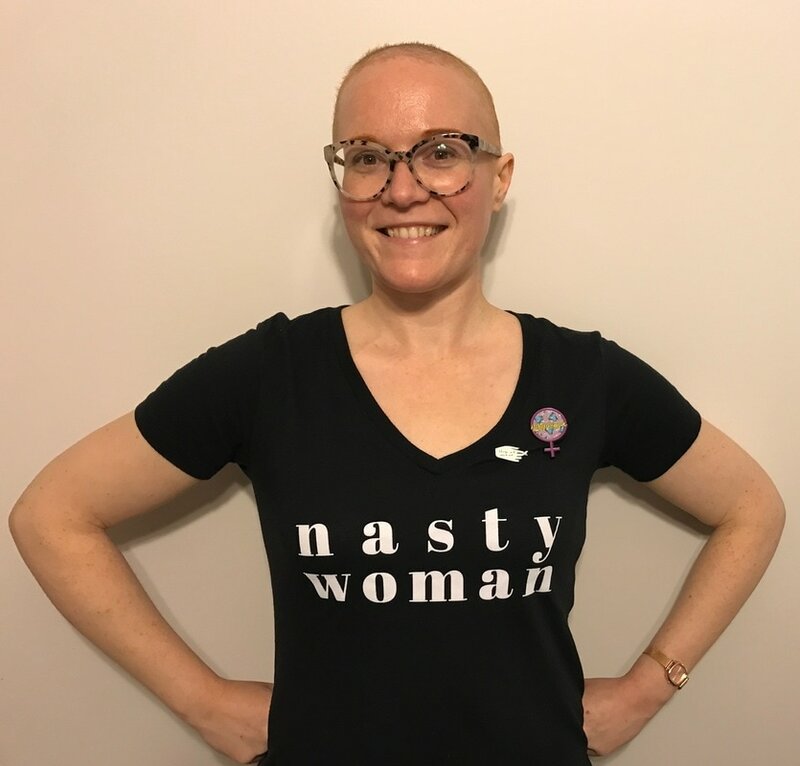 I had and/or have ascites (extra fluid in the abdominal cavity), carcinomatosis (general systemic spread of carcinoma cancer cells), and “nodules,” or tiny little extra tumors floating around in my abdomen. Later on, these nodules started to land in various places and attach themselves to various parts of my insides. As of this latest scan, these nodules, now called “drop metastases” because they’ve literally dropped within my insides due to gravity, have all landed somewhere in my pelvic region, and they’ve all grown. One of these tumors is now 7.5cm in one direction (roughly the size of a clementine?) and is pressing on my bladder. Others are “likely ovarian metastases.” I don’t honestly know whether this means that I now have cancer in my ovaries, or if it’s just little bits of extra cancer on and around my reproductive organs, not necessarily affecting any organ function. Maybe I don’t really want a definitive answer to that question. Regardless, I’m not having any significant symptoms yet from any of these drop metastases, just occasional pelvic pain (like ovulation cramping, which most ladies will understand). And regardless, these extra little cancer bits are raising some complex psychological issues for me, the kinds of conflicting thoughts and worries that I imagine women with reproductive cancers face regularly. And also, I’ve had increased pancreas pain, probably from the growth in the pseudocysts (cystic lesions with a different density and makeup than typical cysts) surrounding my pancreas tumor. All of that means that while the FOLFIRINOX chemo cocktail worked fine on my pancreas and liver tumors, it kind of did diddly squat on a systemic level, allowing these drop metastases to grow way too fast. So David and I crawled through hell four times (those four rounds of FOLFIRINOX), and for what? We’re still here, on the other side, at least. The pulmonary embolism is a surprise. Apparently, though, this happens a lot with pancreatic cancer, which thickens the blood. Fortunately, this one is still quite small, which means we caught it early. The radiologist called my oncologist immediately after the scan, before my clinic appointment, to notify him, so that’s a bit alarming. My oncologist said that while it’s urgent and potentially life-threatening, it’s also very treatable. All I need to do is twice daily shots of heparin (an anticoagulant) for a month, then blood thinner pills for a while. I haven’t had any symptoms from it yet either, which is a good sign. Although now I find myself overthinking my usual breathing patterns, wondering if what I’m feeling any given moment is shortness of breath or not. So far, the shots are going fine. They were icky at first, like the Neupogen shots I’ve done before, with a thick needle on the syringe that doesn’t push into my belly skin very easily. But lately they seem to have gotten easier. I’m about halfway through my month of shots, and I look forward to the end of this chore every 12 hours, and even to the end of the twice daily reminders that pop up on my phone. The positive outcome of this scan is that I finally get to try immunotherapy! I’ve been asking my oncologist about this every clinic visit, and he finally suggested it himself. Now is the right time, because I’ve tried a year of two different chemo regimens. While the first one was very successful initially, this traditional systemic treatment hasn’t been effective enough for me in general. 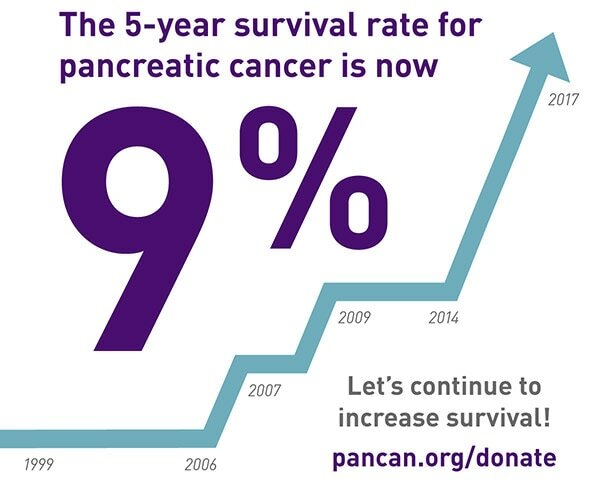 Also, apparently in the last few months, the number of available immunotherapy clinical trials for pancreatic cancer has grown significantly, and there are several new ones at Johns Hopkins itself. David and I researched through the PANCAN clinical trials database and carefully considered our options (at a few Baltimore hospitals, as well as NIH in Bethesda, MD, Georgetown in DC, and Penn in Philadelphia). While we found one we really like at NIH (which I’d prefer to do first, for a variety of reasons), I wouldn’t qualify for our top choice trial at Hopkins if I did this NIH one first. So we decided to go for the Hopkins trial now, and my oncologist is coincidentally the principal investigator. I will hopefully start the screening and enrollment process this week, then start the actual treatment within two weeks from that date. Then it’ll be three weeks on, one week off, with a combination of immunotherapy pills (Palbociclib) and one short weekly chemo infusion (Abraxane). I was hoping to avoid any chemo for a while and do an immunotherapy-only trial, but it seems I might have trouble qualifying for those, because I already have an autoimmune condition, type 1 diabetes. So my hair might fall out again (in which case I think I’ll try out a wig), or it might continue to grow in, which would be a lovely surprise. (I almost have an even buzz cut of new growth now, with this break from treatment.) Fortunately, because I’ll be doing only one chemo drug (as opposed to three or four, as with my previous treatments), the side effects should be pretty manageable. Unfortunately, clinical trials are quite time-intensive and run on regimented schedules, so I won’t have the flexibility I’ve had so far, and I won’t be able to tailor my treatment schedule to my work schedule. We’ll see how it all works out. So for now, we are cautiously optimistic. Immunotherapy is incredibly promising and exciting, the forefront of cancer research and the closest science has come to a cure. In fact, a good friend of mine who works in a cancer research lab and is currently taking a graduate course on advanced cancer biology, just told me yesterday about her professor’s astounding success treating APL leukemia. He’s achieving a 96% complete response (“no evidence of disease,” which is virtually a total cure) in his patients, treating them with high doses of vitamin A (the immunotherapy component) and tiny doses of arsenic (the systemic toxin, or chemotherapy component). These results are absolutely staggering, especially for a cancer that has been notoriously difficult to treat. Of course, all pancreatic cancer, and mine in particular, is generally resistant to treatment, and so far, researchers have not had the same success with immunotherapy for pancreatic cancer that they’ve had for other cancers. But my oncologist did say that research so far has shown that patients who are treated with both Palbociclib and Abraxane have better outcomes than those who are treated with either drug individually. It’s certainly worth a try. As always, I’m consciously working on remaining mindful in the present moment, detaching myself from worries and expectations about the past or the future, and hoping for the best while preparing for the worst. This is the healthiest, most comfortable approach for me, so I’m sticking with it. One day at a time.